This is a unique program created for students who would like to have an experience and earn money after they finish their studies in the UK. The Structure of the program is based on a minimum of 7 weeks study + a minimum of 6 - 12 months paid work. The study part will be undertaken in conjunction with Flex Academy - Bournemouth. Flex Academy is an English teaching centre and students will take min. 10 lessons per week. If the student would like to study more or the InterCon UK consultant requests more study weeks in order to be able to place student, then more weeks can be taken. Flex Academy: Flex Academy is an English language teaching centre and one of the most competitively priced school in Bournemouth. However, the school does not compromise on quality. The school is located in the town centre. The work placement starts after the student has finished the min. 1 week study period. InterCon UK find work placements mainly in Hotel, Catering & Hospitality sector. Therefore, students generally work in hotels, restaurant, bars, and fast-food chains. A full time person who works 39 hour per week will earn around a minimum of £250 before tax each week. Note: we are looking for waiting staff and chefs who can start to work immediately. Experience in this field is preferred but not essential as full training can be given by the employer. The work placement is for min. 6- 12 months. The work placement can be anywhere in the UK. The student will know where their work placement is going to be before they finish their studies. Some employers provide accommodation and the cost of this can be deducted from the student’s wages. If employers don’t provide accommodation, the student is responsible for finding their own accommodation. However, InterCon UK will give advice to the student in finding accommodation. InterCon UK has very good connections with the international hotels chains as well as with restaurants in the UK. For ambitious students this program can be a successful gateway for a career. Students are responsible for arranging their own acommodation during their study and work placement.InterCon UK, will give advice how to find suitable accommodation. The student must have min. intermediate level of English ( B1) before they start their English course at Flex Academy. If the student’s English level is not to the required level, then the student may take more weeks to learn English to be eligible for work placement. Experience is preferred in the Hotel, Catering & Hospitality field but is not necessary. If you have basic skills or knowledge of cooking or have experience of cooking, please mention this to your InterCon UK consultant when you register. The process starts by filling in our Work & Study in the UK application form. This form will be sent by email up on request. 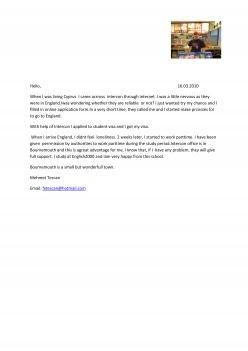 The student fills in the application form and sends it to InterCon UK Bournemouth office along with their CV and any work references they may have, min. 2 weeks before the course starts. The course starts at anyday. Once InterCon UK receives an application with a CV, the recruitment Consultant will contact the student to establish whether the student is suitable for this program. If the student is accepted into the program by InterCon UK, then InterCon UK will contact Flex Academy to arrange the course on behalf of the student. Payment for the program can be made directly to Flex Academy - Bournemouth or to InterCon UK, min. 2 weeks before the course starts. When the student arrives in Bournemouth, our Recruitment Consultant will contact the student and invite the student to InterCon UK’s office for an informal meeting. During the meeting our consultant will get to know the student better and develop a work placement plan with the student. InterCon UK will support the the student from registration right through until the student finish their work placement. During the this time, the student can contact our dedicated consultant at any time with the reasonable questions or problems. InreCon UK will also help the student to get a National Insurance number, to open a bank account and to register a the local doctor’s surgery. If you have any questions or would like to learn more information please send email to office@interconuk.org Oner of our consultant will contact you shortly. This page has been updated on 16. January 2019 15:21.